In this—as usual, far too long—post, I will try to make sense of a painterly victory over eternity. How can a painter title his painting a victory over eternity? Victory over Eternity [1920-21] is one of the few entirely abstract paintings by the Russian “proletarian painter” Pavel Nikolaevich Filonov. Unlike his other compositions and unlike other Cubo-Futurist paintings of the same period, it does not have any figurative elements feeding the pictorial plane. In mainly green, white, black and red, the painting is characterized by a vigorous structure that winds its way through the picture plane more or less like a helix. The complex vortex of small cubes and triangles on the lower part of the painting could be read as a landscape, leading the viewer to move their gaze, past a certain “mountainous” horizon, towards the larger shapes on the upper side of the painting. However, the painting defies any literal reading, the complex maze of shapes preventing the viewer from reading it in any way as either landscape or portrait. Filonov’s painting also has no depth. As in some of his other works, the geometrical shapes saturate the picture plane, leaving no space for distance or perspective. 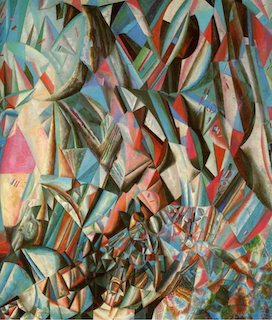 Filonov’s style of painting has often been described as a “kaleidoscopic fractured image,” “a mosaic,” “a puzzle,” “a molecular organization,” “a painted tapestry,” and “an atomist rendition.” It reflects the artist’s obsessive and complex compositional structure, one usually associated not only with the broader developments of Russian Cubo-Futurism, but also with his idiosyncratic way of painting, which he calls “Analytical,” a style that prevents the viewer from discerning a cohesive painterly process. The eye cannot grasp the whole, it moves over the busy visual fields, from one detail to another without being able to make any meaningful correspondences. This allows most scholars to conclude that Filonov’s famous painting defies any stylistic classification, blurring the boundaries between cold abstract geometry and vivid expressionism. John E. Bowlt, Nicoletta Misler, Jean-Claude Marcadé, Evgueni Kovtoune and others argue that this idiosyncratic style is specifically Russian and, unlike many of his contemporaries, does not follow or respond to the usual precepts of Western European Cubism. Cubism, for Filonov, is the result of an arbitrary use of geometry to represent a given object or idea, while he seeks the invisible in geometry, not in principle, but in its actual occurence. Filonov’s scientific method of painting therefore consists in passing from one application of shape and colour to another. This simple method is based on the belief that a specific shape and colour only exists on the canvas because of the other shapes and colours surrounding them. The painting is indeed a puzzle for which each shape and colour necessarily exists because of the next one without overall pre-determined pattern. The crucial thing about this scientific method is that it is completed through a process of logical deductions that is essentially un-retraceable. Filonov’s over-saturated paintings focus on the moment of making without giving the viewer the possibility of creating links or narrations. However, the title of the painting nonetheless tells us that it “represents” a victory over eternity. How this success over eternity comes about is unclear. Bowlt explains Filonov’s extreme accumulation and lack of semantic axis as the result of the spatio-temporal evolution necessary for his painting to come into being. “Unlike realist work, the visual sequence across the surface of the canvas (a narrative sequence and, therefore, a temporal one) turns into a ‘non-sequence’ in a Filonov analytical painting, i.e. into a constant interfusion of past, present and future.” The finished work therefore “represents,” following Bowlt, a series of “non-sequential” fragments of time with no discernible movement, direction, or durational coherence. Firstly, Filonov does not attempt to represent a correct or accurate understanding of time; he only wants to pass from an approximate apperception of time to its full pictorial embodiment on the canvas. As is well known, Filonov’s approach is projective in as much as he refuses to create a separation between thought and deed. His Analytical Art projects itself on the picture plane, concretely embodying what is not as a static temporal entity, but in its indefinite happenstance. The broken down parcels of time are therefore analytically fragmented embodiments of time lived mindfully without exact determination of proximate cause or effect. Secondly, Filonov rejects the conventions of abstraction in paintings in order to reveal how eternity can be embodied themselves in the act of painting. Unliked mystical or metaphysical abstract representations (Hilma af Klint, here springs to mind), there are no abstract renditions of eternity here. Filonov knows that to thematize non-time effectively cancels the undertaking, even if it is highly abstracted. By preventing viewers from grasping a meaningful whole or void standing in for eternity and forcing them to move unsteadily from one detail to another, Filonov exposes eternity precisely as that which cannot be grasped: what unsettles and confuses. With this two-fold strategy, Filonov does not, in turn, pretend to cancel any conceptualisation of time or eternity and he does not pretend to do away with finitude. He calls instead for a renewed relationship to time and eternity, asserting that both take place here amidst endless limitation, boundaries, stops, gaps, intervals, shifts, etc. The crucial thing with this assertion is that it does not take place with respect to a centre of subjectivation (the viewer facing eternity, for example) or a pictorial strategy (lines evoking infinity, for example). There is no viewpoint, angle, direction, or standpoint. For Filonov, time and eternity are always already here amidst endless fragmentation. The molecular or atomist organization of Filonov’s painting thus reflects a scattering of time and eternity as part of finite space, within the confines of a small canvas. It is from the premise of these finite confines that emerges Filonov’s victory. As he says, “Everything comes out of life. There is no void. From now on, paintings will live, talk and think, metamorphosing themselves into every mystery of human life… past, present or future, their eternal roots are within us.” Free from the constraints of all forms of cannon (Cubist, Cubo-Futurist, or mystical abstraction), Filonov claims a victory over eternity because he knows that, like for time, it is not something that you can take over. His victory is a realisation that we are time and eternity even if we die and this is precisely why we can never truly represent ourselves or the world. Stanislas Zadora, “La Filonovchtchina,” in Filonov (Paris: Centre Georges Pompidou and Lenningrad: Russian Museum, 1990), p. 167, my translation. These texts were assembled by John Bowlt and Nicoletta Misler in Pavel Filonov: A Hero and His Fate (Austin: The Institute of Modern Russian Culture, 1983). Quoted by Boris Groys in “Filonov’s Organic Machines,” in Art in America (November 1992): 100. See Misler and Bowlt, Pavel Filonov, p. 47. See amongst many others, John E. Bowlt, “Pavel Filonov: His Painting and His Theory,” in The Russian Review 34, no. 3 (July 1975): 282-92. Evgueni Kovtoune, “‘L’oeil qui voit’ et L’oeil qui sait’ de la method analytique de Filonov,” in Filonov, 1990, p. 116 & 122, my translation. Quoted by Jean-Claude Marcadé, in “Pavel Filonov 1883-1941: Une avant-garde à contre-courant de la ligne dominante,” in Cahiers du Musée National d’Art Moderne 11 (1983): 113, my translation. Pavel Filonov, Letter to Vera Pochlo, July 1928, translated into French by Stanislav Zadora, reproduced in Filonov, 1990, p.128, my translation. As it will become clear, Filonov’s paintings are not a form of automatism because they attempt to picture a “passing present,” not the unconscious bodily movements of the artist or that of chance. See Charlotte Douglas, “The Universe Inside and Out, New Translations of Matyushin and Filonov,” in The Structurist 15-6 (1975-76): 73. Misler, Pavel Filonov: A Hero and his Fate, p. 61, translation modified. Bowlt, “Pavel Filonov: His Painting and His Theory,” p. 285. Filonov, “The Basic Tenets of Analytical Art”, in Pavel Filonov: A Hero and his Fate, p. 149. Pavel Filonov, “Made Painting” , in Filonov, 1990, p. 72. Marcadé quotes a French translation published in Continent 1 (1989): 170, my translation from the French.